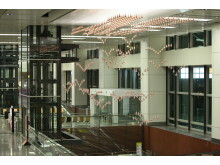 Kinetic Rain is made up of 1,216 bronze droplets that transform elegantly into multiple shapes, akin to poetry in motion. 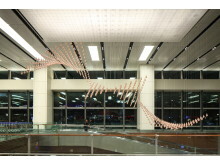 Carrying an aviation theme, the key element in every shape shows the movement of flight through slow, fluid movements. 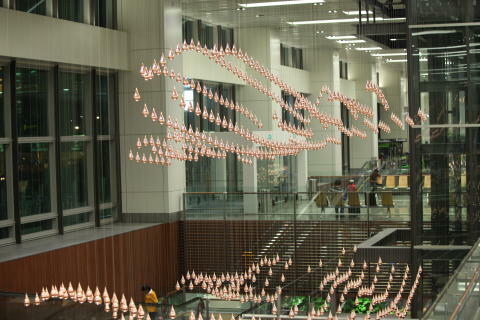 This aeroplane shape is one of the formations in the sequence. 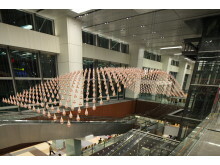 Kinetic Rain, the world's largest kinetic art sculpture, was officially unveiled today. 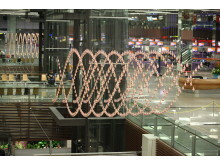 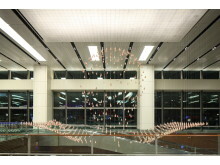 The sculpture takes pride of place at Terminal 1's Departure Check-in Hall and it is installed as part of the terminal's upgrading project. 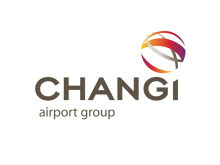 The refurbished T1 is aptly themed ‘Tropical City’ in keeping with Singapore’s garden city status and where rain, is very much a part of the tropical climate.